This individual Report Non-Prime Issuing Opportunities: Setting Multiple Bars for Diverse Segments is available for purchase. This Report is available to members of Mercator Advisory Group’s Credit Advisory Service. Please be advised that this Report is normally part of a research and advisory service that provides ongoing support throughout the year. As such, this Report contains significant depth of content that is selected for its strategic importance to our members. (For a description of these services, see our Advisory Services section). "no file" prospects remaining on the frontier of specialized, sometimes narrow data sources, specialized analytics, and alternative card products. 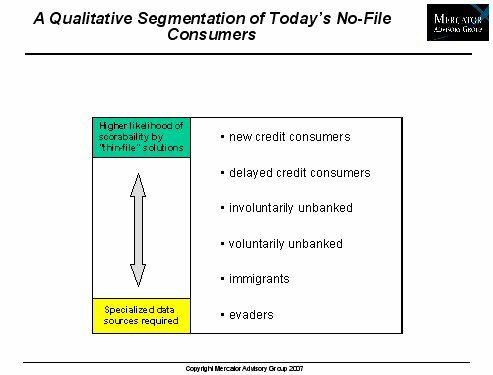 None-prime consumers, defined by multiple segments delimited by bureau score ranges or lack of bureau files, represent 80 - 105 million credit prospects. Subprime credit card prospects, defined by a demonstrated history of credit problems, are so far avoiding the drastic declines of subprime mortgage holders. Thin file credit underwriting tools are rapidly maturing, with an ability to handle previously-unscorable individuals. Remaining unscorable prospects with no bureau files reside on the frontier of underwriting tools. Specialized data sources and analytics are the tools of lenders wishing to address these remaining no-file prospects. Ken Paterson, Director of the Credit Advisory Service at Mercator Advisory Group and the author of this report comments that, "clearly credit card issuing in the non-prime segments is a tough business - but so is issuing to prime customers with mail response rates below 1%. At least there are new and underserved prospects in the non-prime pool. The challenges are identifying their risk profiles and matching them with appropriate pricing and monitoring parameters." The report is 30 pages long and contains 11 exhibits.